petition: We need a governor who values education. 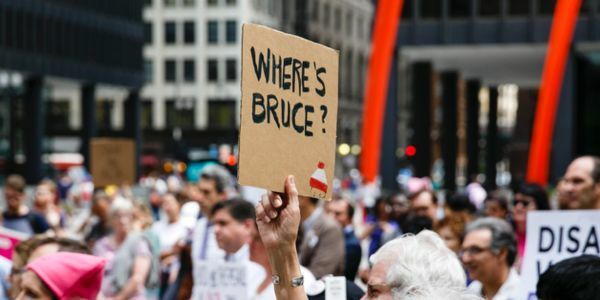 Bruce Rauner has shown us that's not him. We need a governor who values education. Bruce Rauner has shown us that's not him. I've always been passionate about education. Providing a quality education at every level ensures that our kids are prepared when it's time to enter the workforce and have the tools they need to succeed. That's why I am committed to investing in education, from early childhood on. But right now in Illinois, our education system is far from where it needs to be because Bruce Rauner has failed to support it. Only 35 percent of 4th graders are reading at proficiency, just 38 percent of high school graduates are college-ready, and only 50 percent of adults have a post-secondary degree or credential. We need a governor who believes in investing in the next generation of Illinoisans. Sign here if you agree. Under Bruce Rauner, tuition hikes have led Illinois students to flee our state. His 736-day budget crisis led to MAP grants being cut and five state universities being downgraded to junk status. Rauner has shown us again and again that he does not value having quality education in Illinois, and it's time to act. As governor, I will be committed to guaranteeing a quality education for every Illinoisan. From ensuring every child can attend preschool and kindergarten, to investing in higher education so students can attend college without accruing crippling debt, I have real plans to support Illinois students. Join me as we defeat Bruce Rauner and make sure Illinois is a state where all of our kids can succeed.